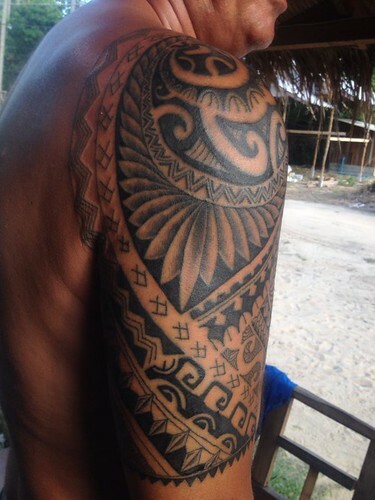 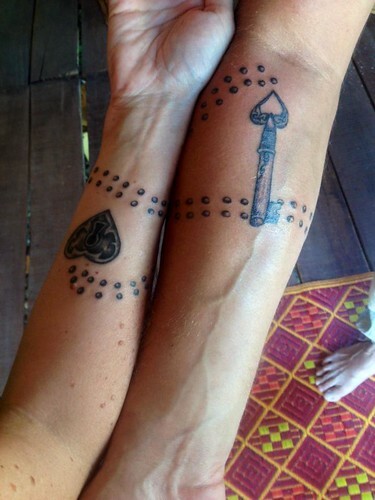 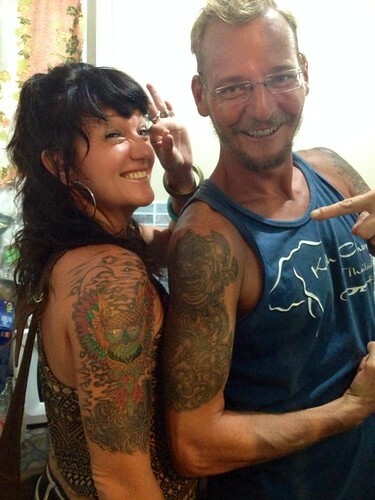 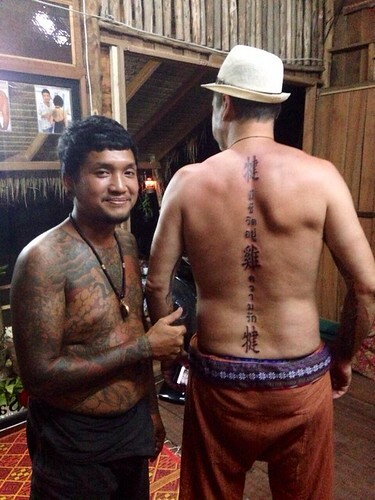 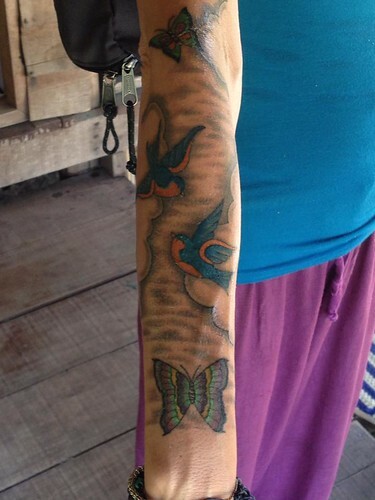 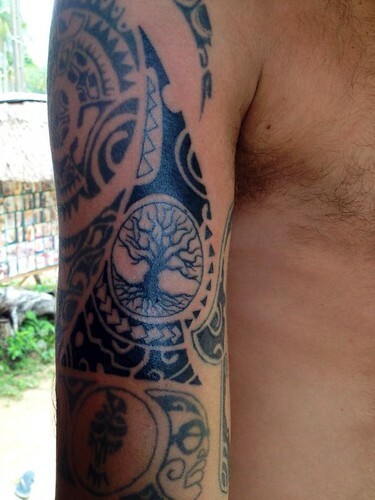 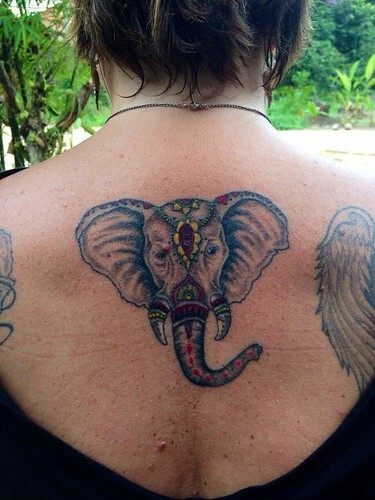 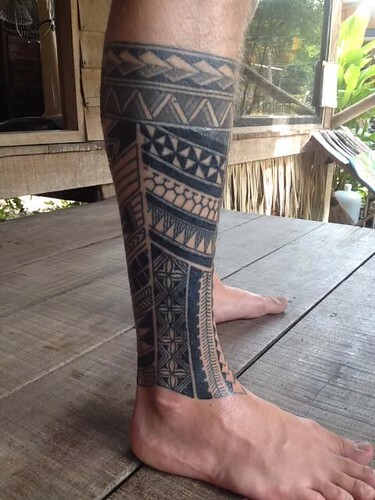 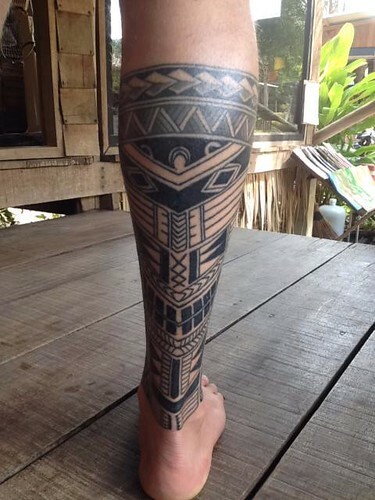 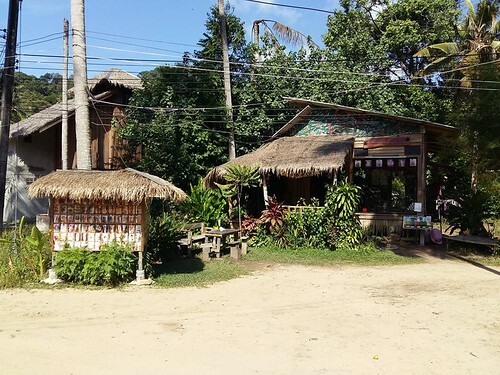 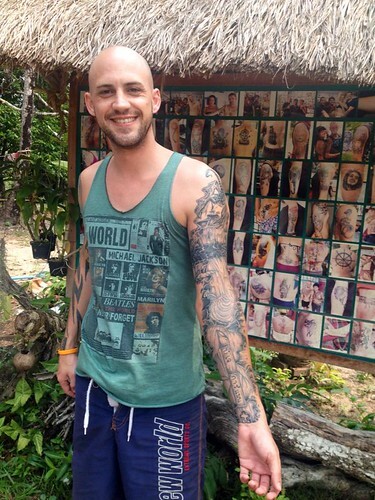 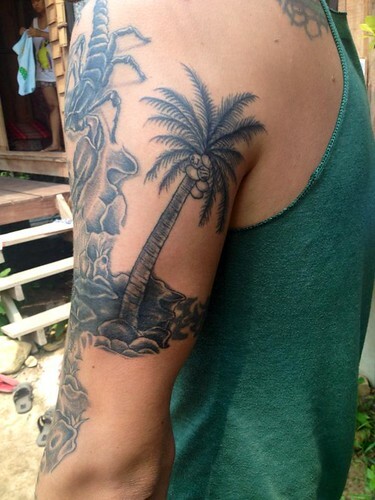 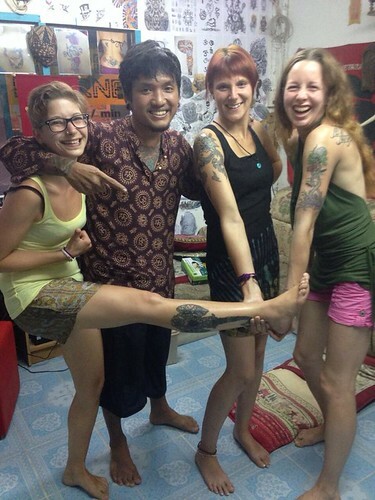 Located at the extreme south of Koh Chang, in the bay of Bang Bao and in the village of Klong Kloi, between Tree House Cottages and Sea You Place, King is an expert in Bamboo tattooing. 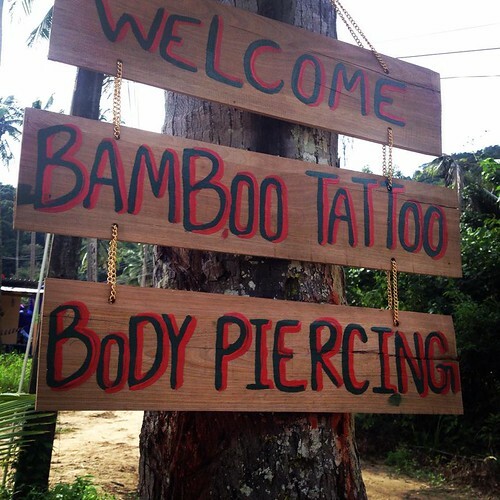 What is bamboo tattooing? 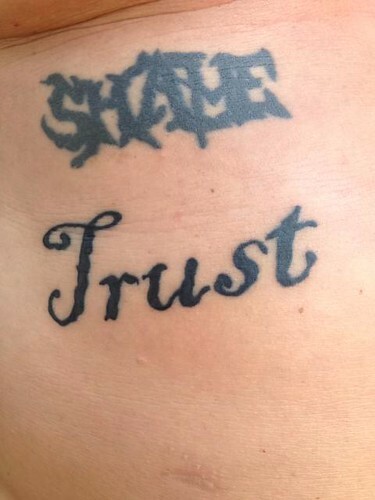 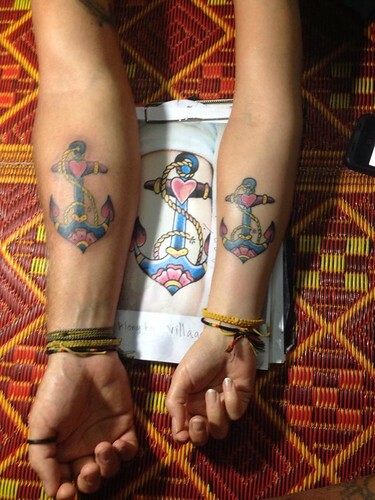 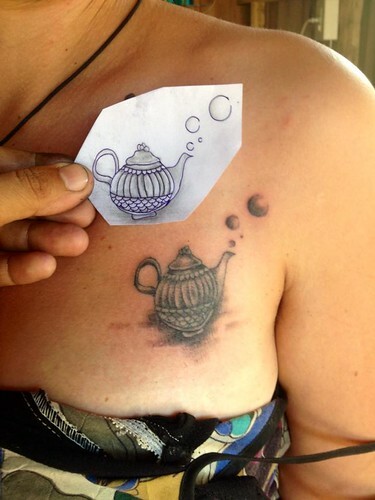 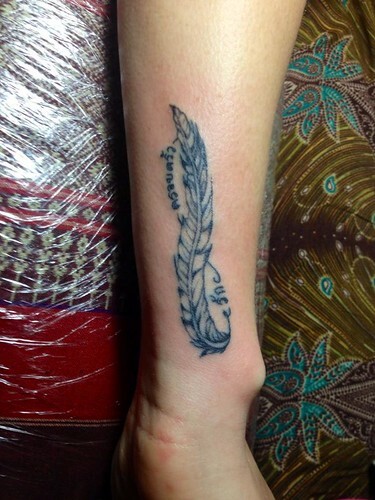 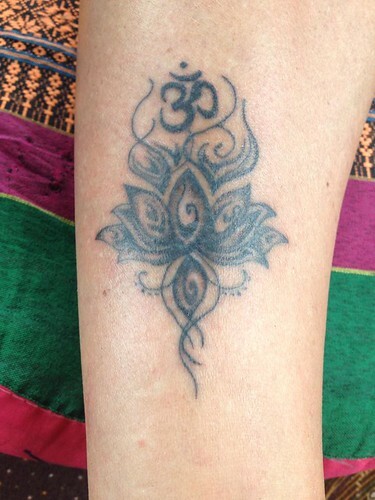 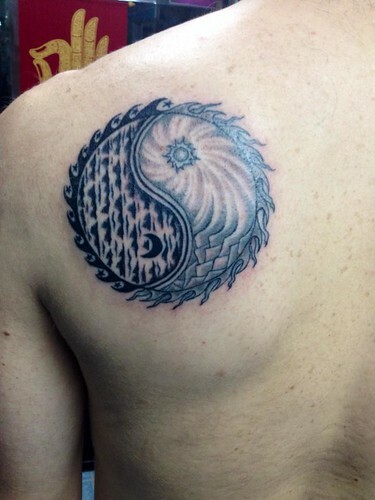 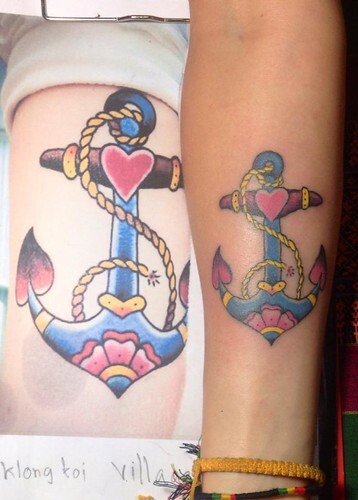 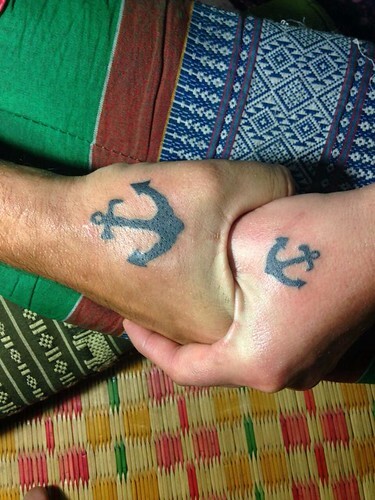 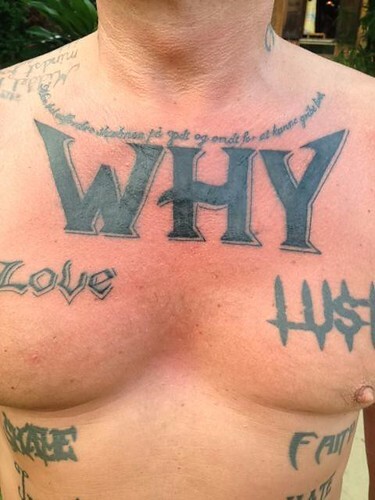 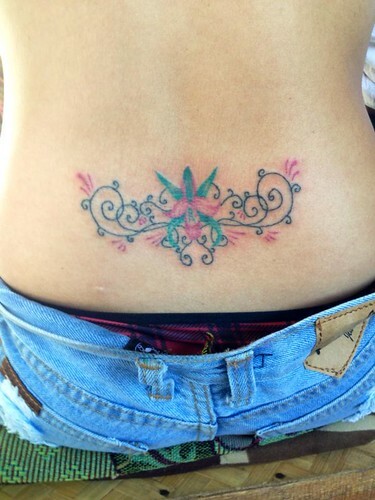 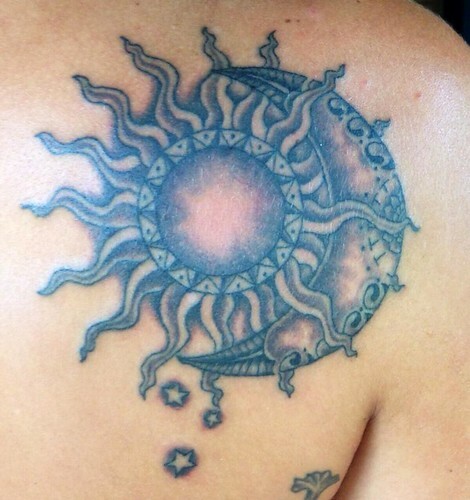 What is the difference with machine tattooing? 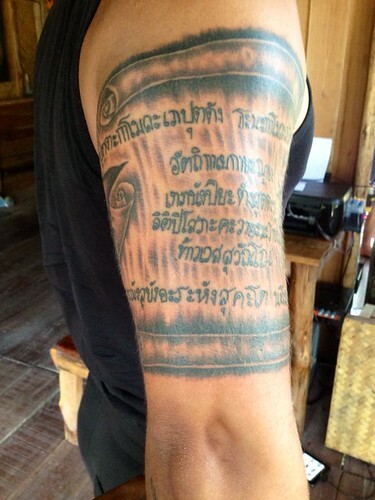 Bamboo tattooing is an ancient and traditional Asian technique coming from the Khmer period, around 3000 years ago. 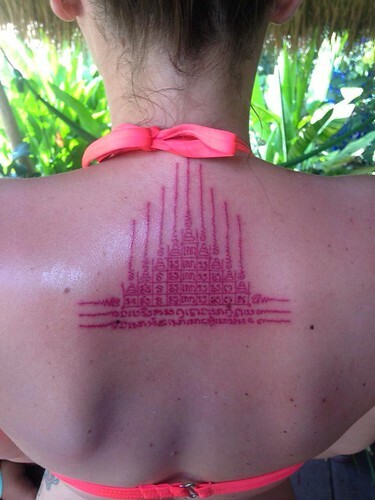 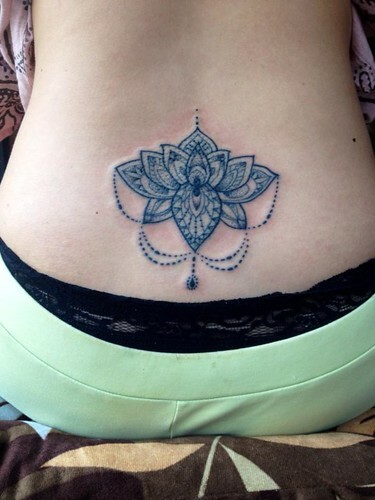 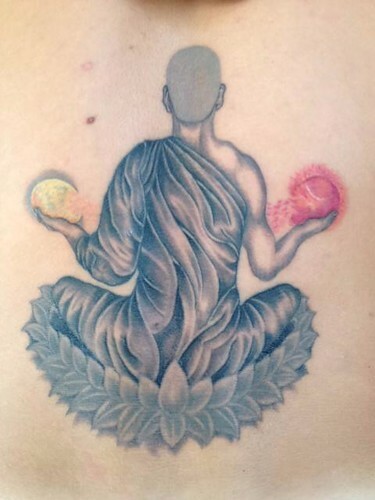 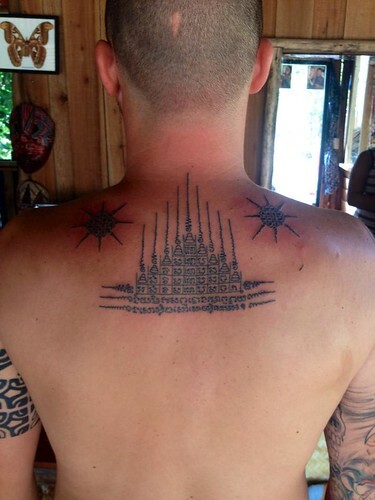 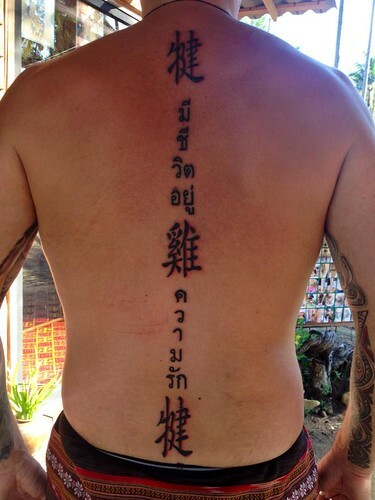 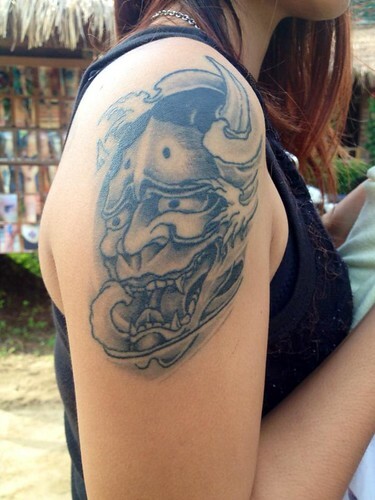 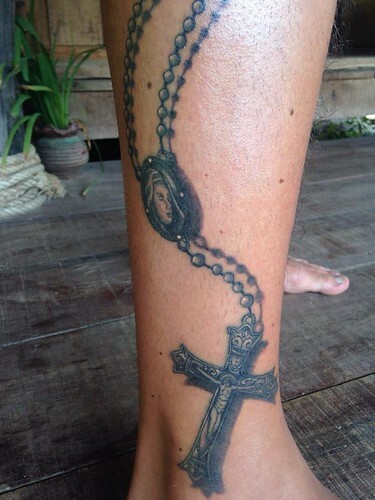 In Thailand it started in the Buddhist temples with monks receiving religious text tattoos for protection. 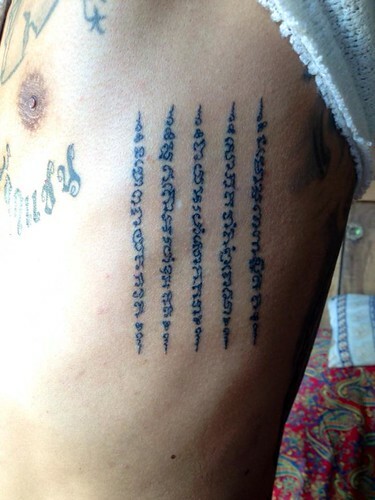 During the different wars and conflicts in Thailand, the soldiers were tattooed by monks with spells as protection, strength and invisibility. 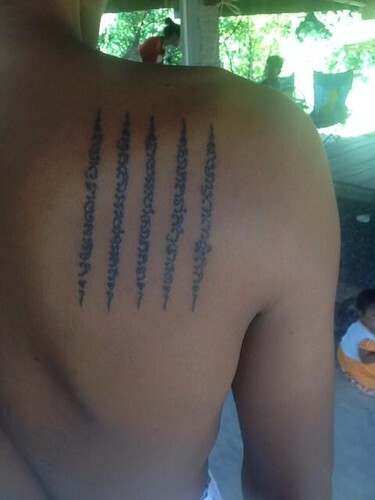 One Thai legend states that Thailand has never been occupied as the Thai soldiers are warrior ghosts who cannot be seen or killed by the enemy due to their protective tattoos. 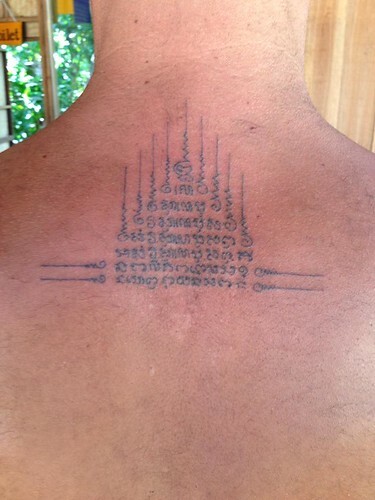 In Thailand, nearly all Buddhist men become monks at some point in their lives to better understand their complex religion. 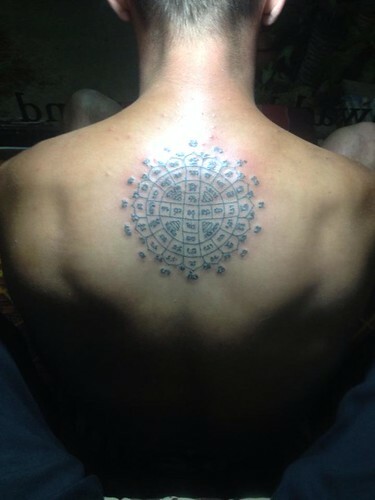 During this time they were tattooed with religious texts to show the strength of their faith. 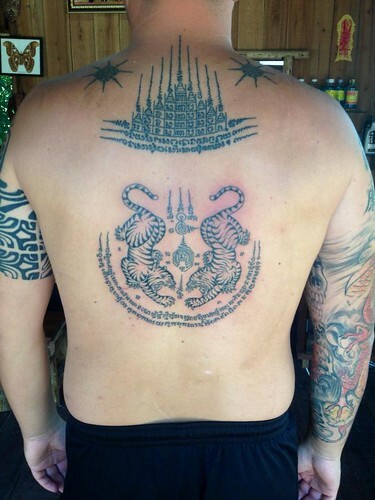 Despite these deeply religious origins, tattoos are not currently mainstream in Thailand and largely seen, as historically in western culture, to be popular amongst criminals. 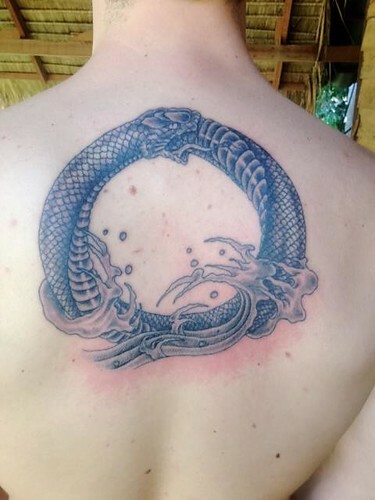 This has only recently begun to change but nevertheless the art of bamboo tattooing is dying out with prevalence of learning to tattoo with a machine as it is easier to learn. 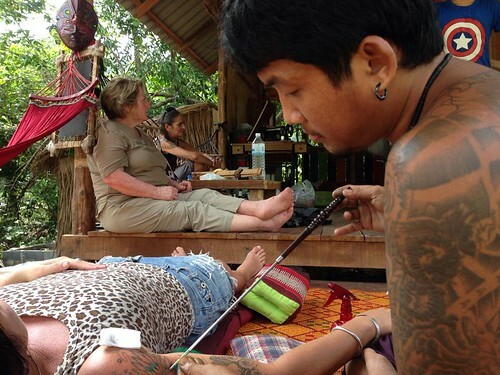 Bamboo tattooists are using very fine needles attached to the end of a thin piece of bamboo. 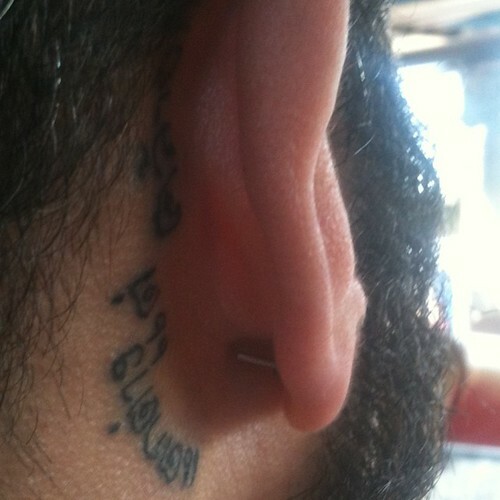 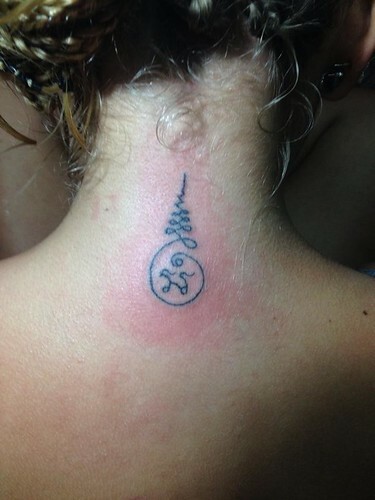 The needles, normally 5, are put in a line instead of a round bullet so that a very fine line can be achieved. 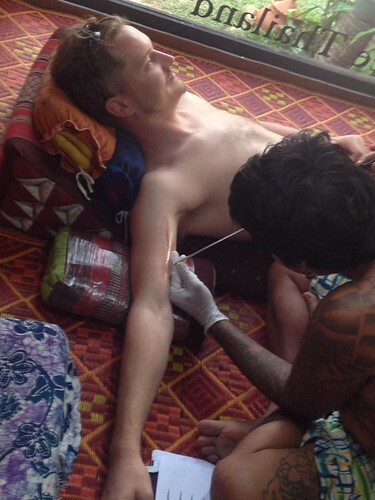 This is then gently tapped into the skin. 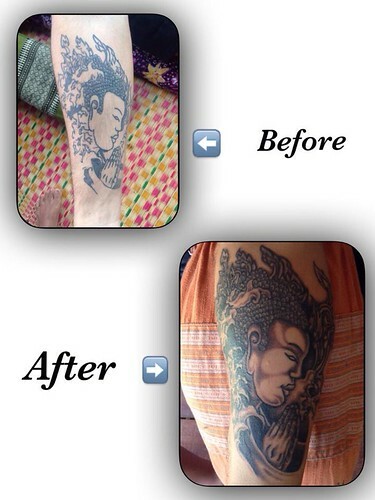 With bamboo tattooing, the skin is punctured but not torn, which results in a significant reduction in pain and bleeding. 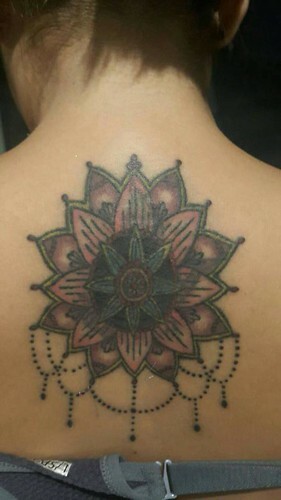 Consequently there is no scabbing as with most machine tattoos, resulting in a very quick healing process, usually around four days. 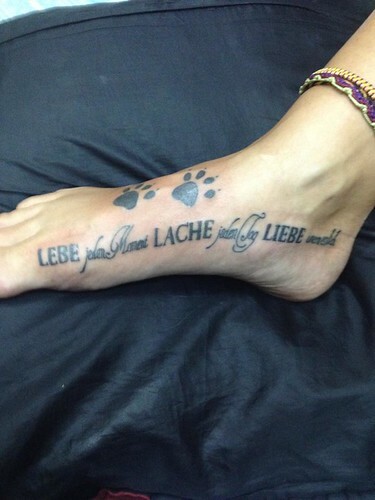 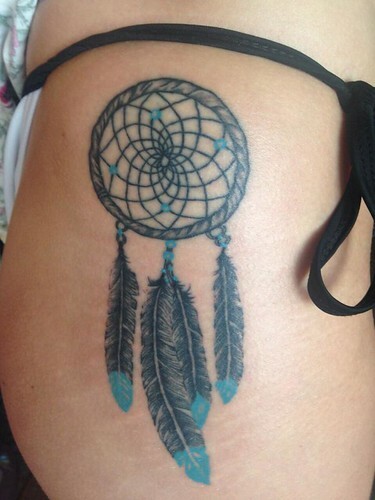 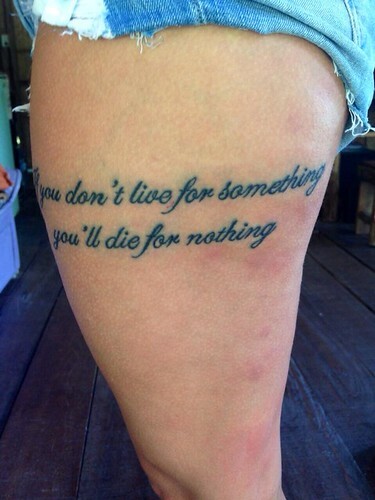 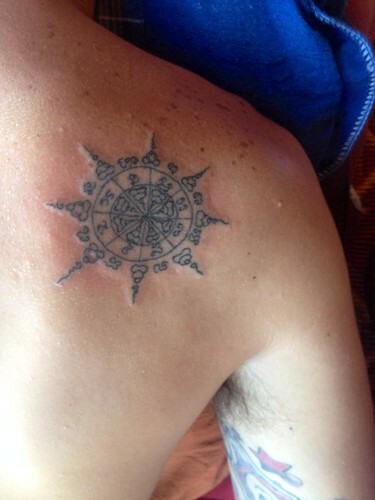 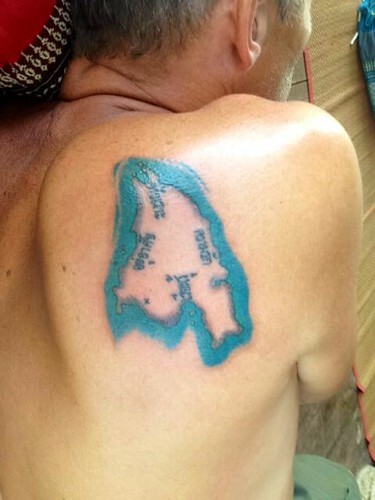 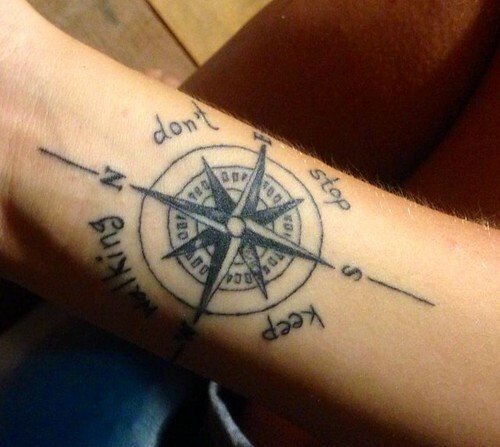 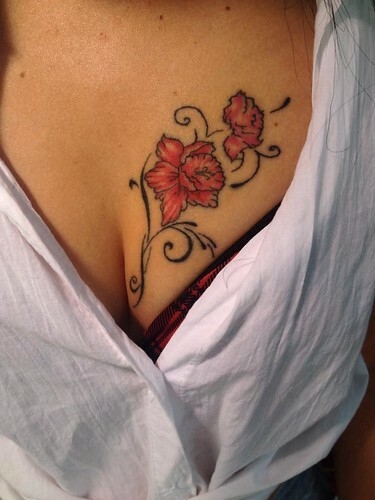 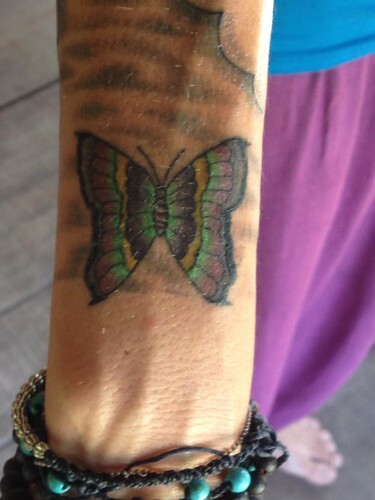 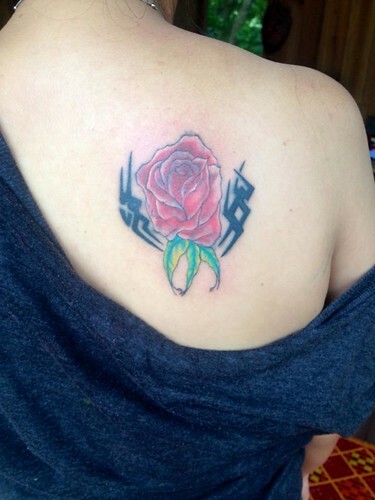 The tattoo therefore doesn't crack or go patchy meaning there is no need for touch ups. 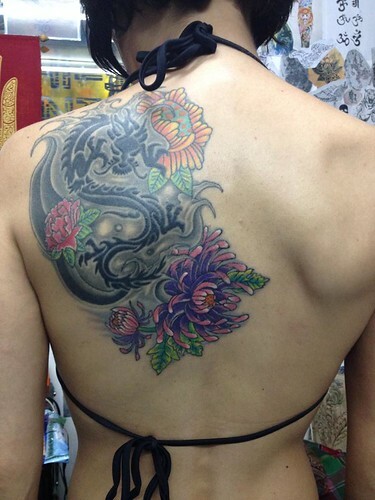 Furthermore as there is no blood to push the colour out of the skin, the ink settles quite deeply and no colour is lost. 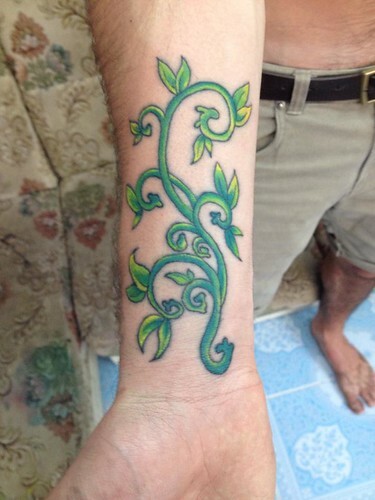 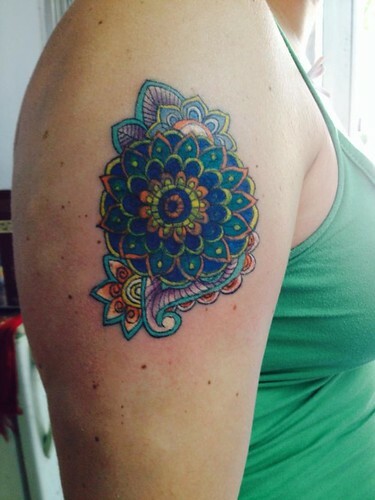 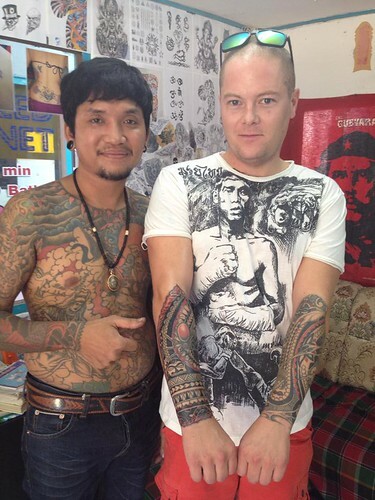 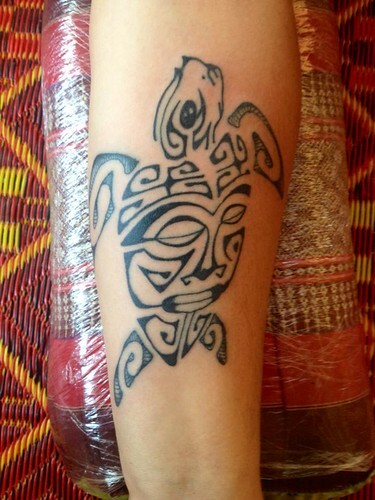 Bamboo tattoos tend to maintain their colour extremely well, staying bright and strong. 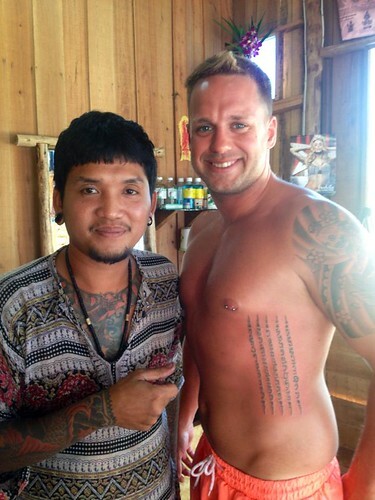 There is absolutely no problem going into the sun following the bamboo method of tattooing. 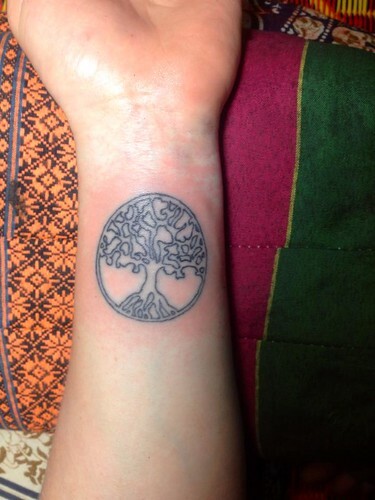 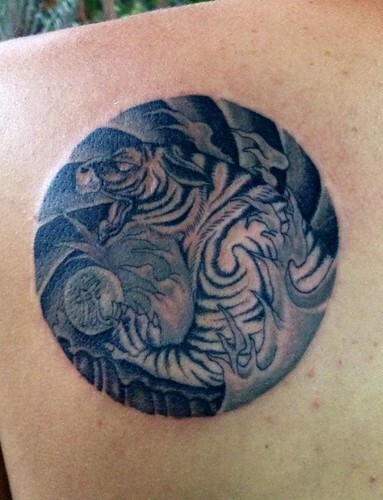 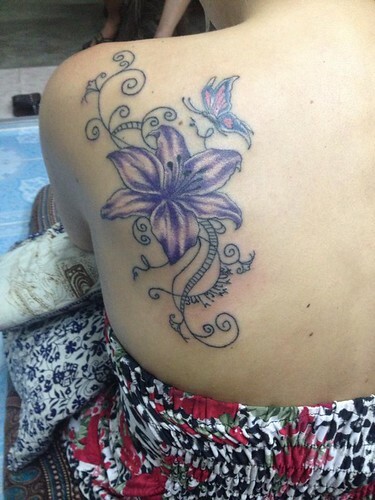 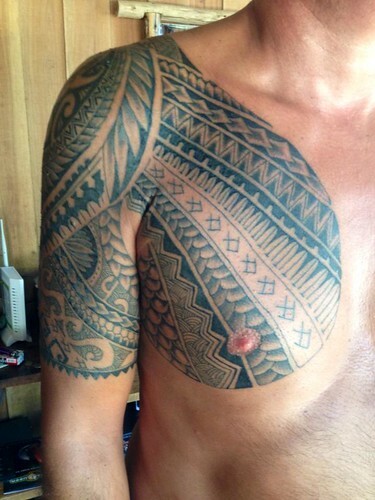 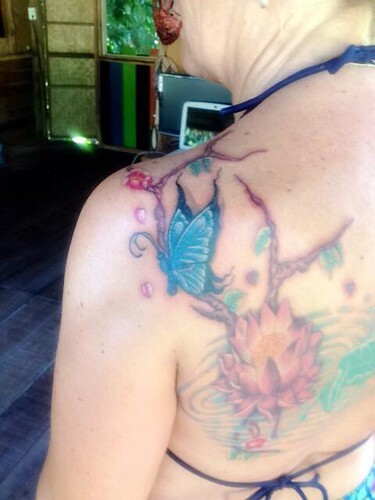 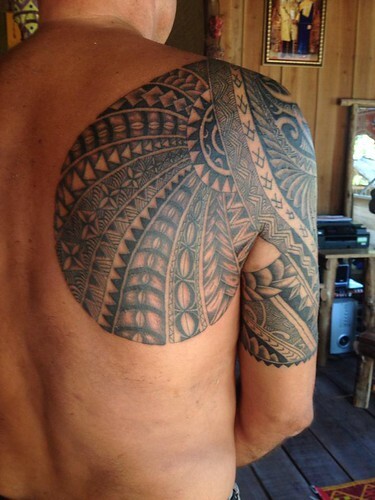 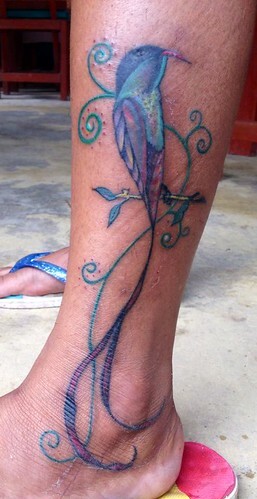 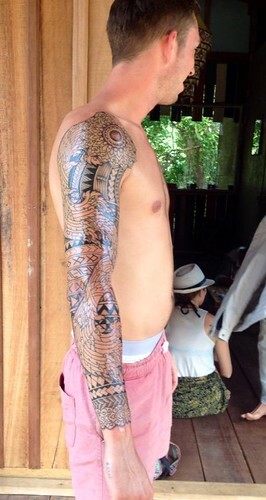 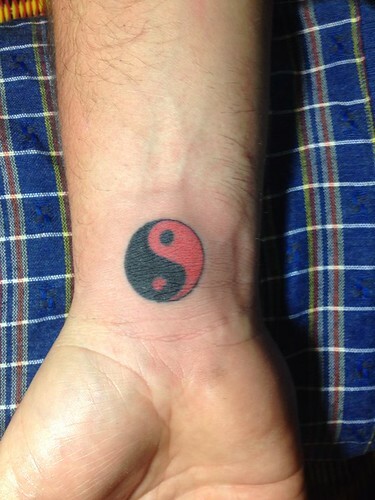 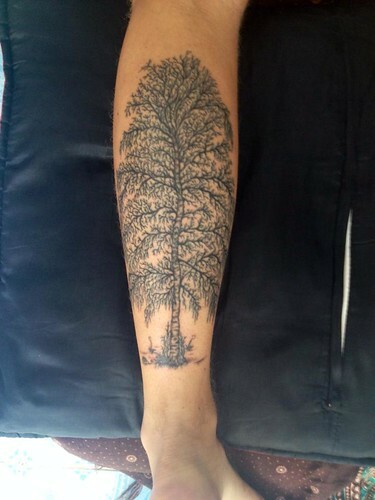 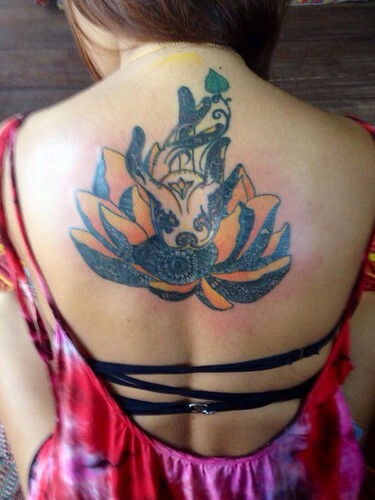 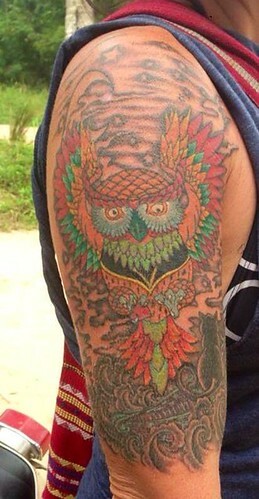 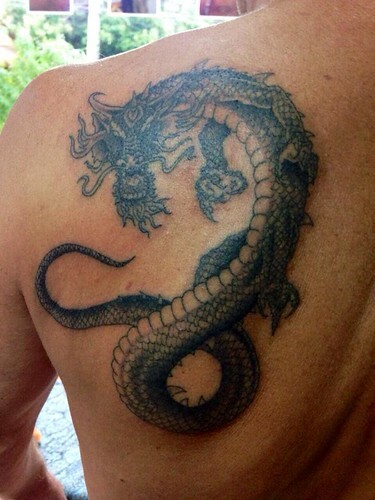 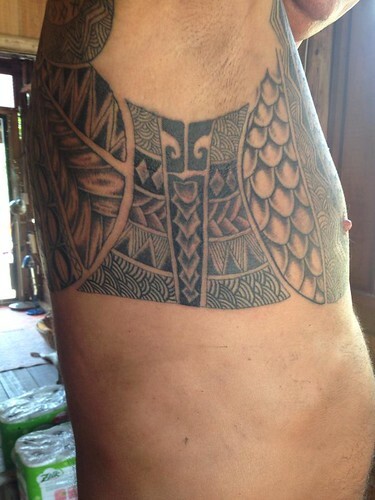 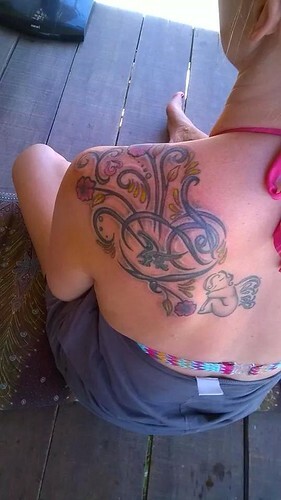 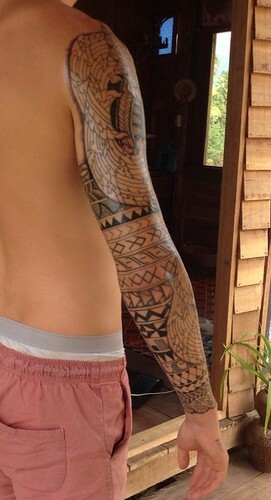 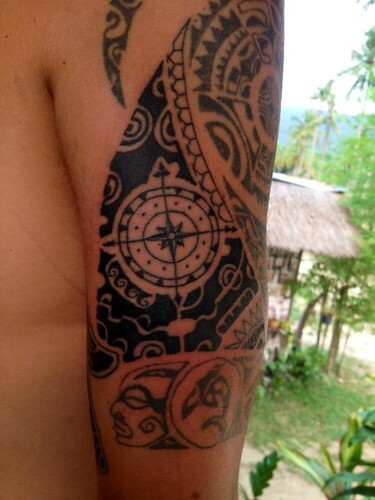 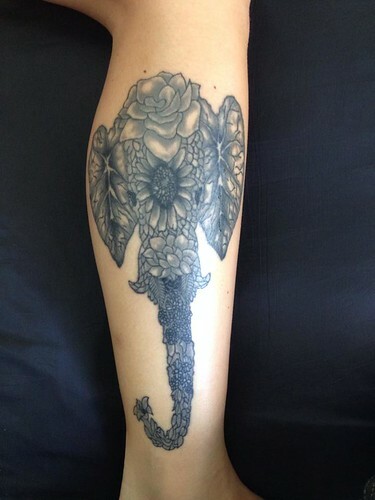 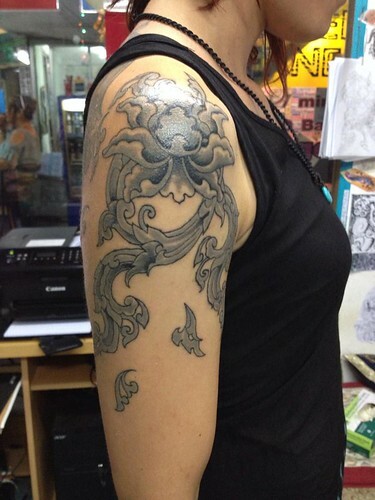 Another major benefit with bamboo tattooing is that it is 90% LESS painful than machine tattooing. 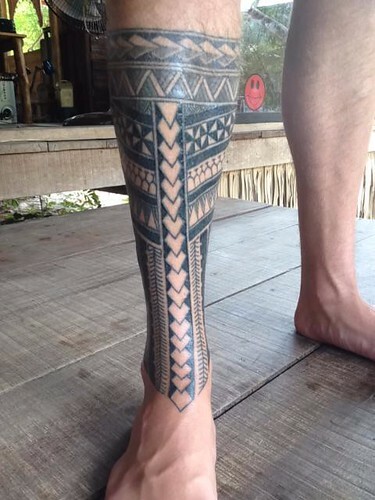 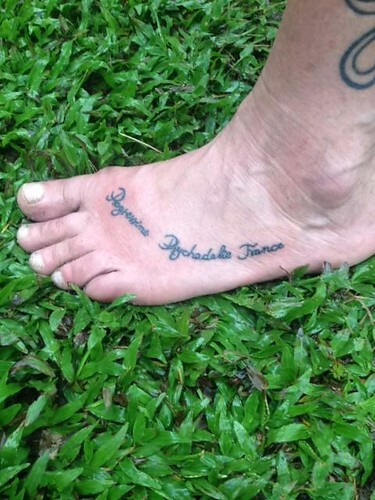 Bamboo tattoos are recommended for delicate areas to tattoo such as feet, which are not ideal areas for the machine to tattoo due to inevitable rubbing and fading caused by wearing socks and footwear..
With more than 10 years of experience in traditional bamboo tattooing, King became THE expert in this art. 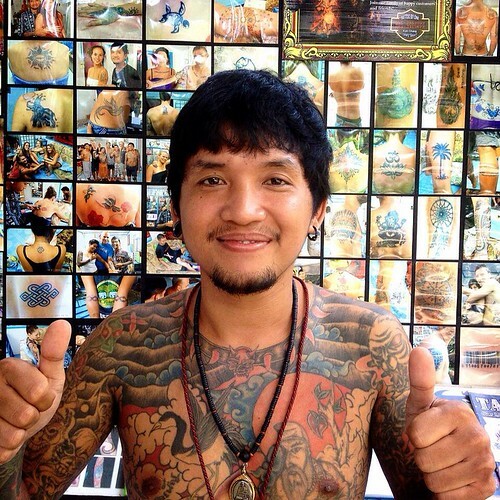 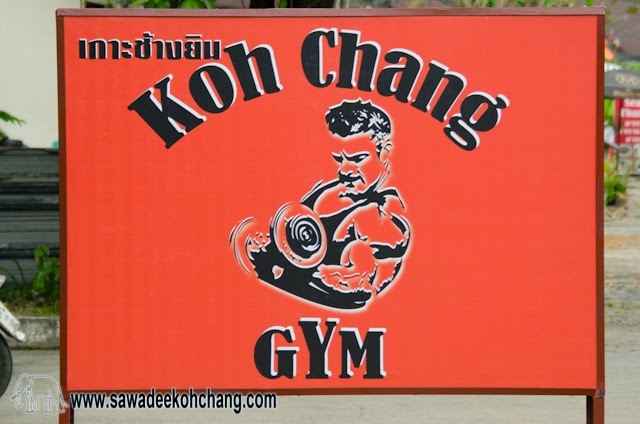 Come to visit him at Klong Kloi village, show him your design and he will help you to make it unique. 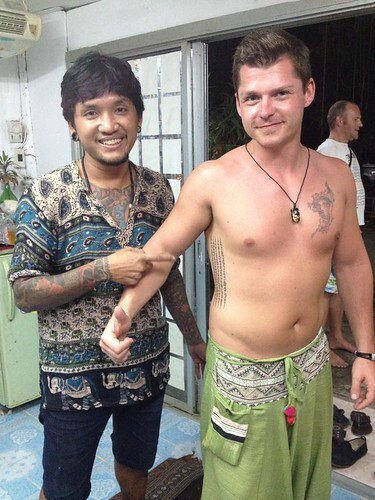 And as explained above, you can go to swim and continue your holidays after like nothing has happened, this is the big advantage of bamboo tattooing. 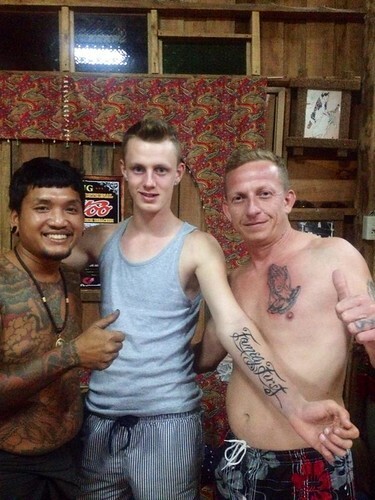 King is very friendly, he will know how to make you feel relax. 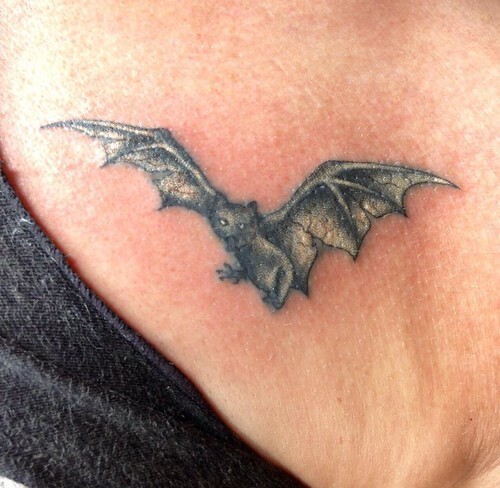 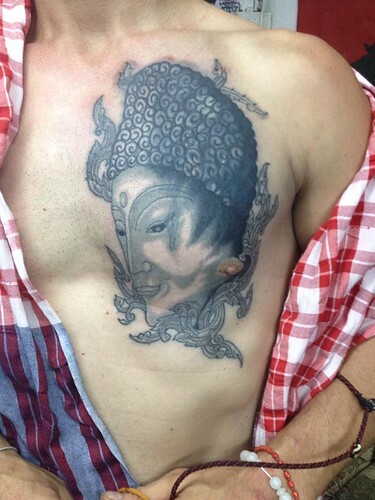 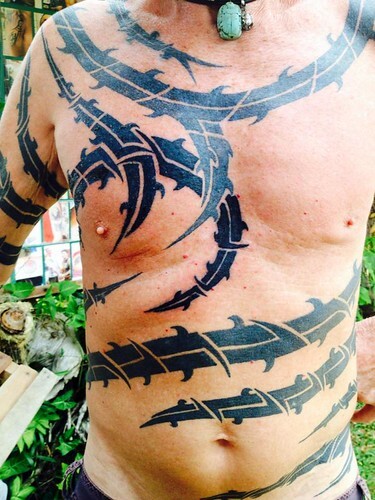 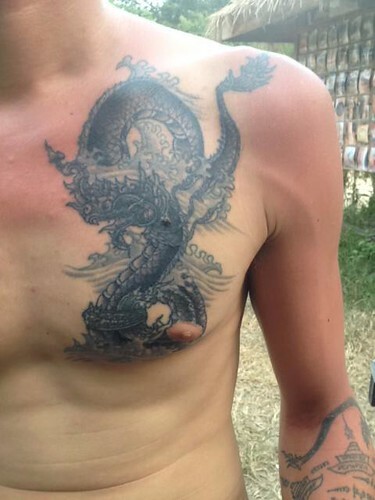 He is also very safe and clean, using only sterilised needles and professional tattooing ink. 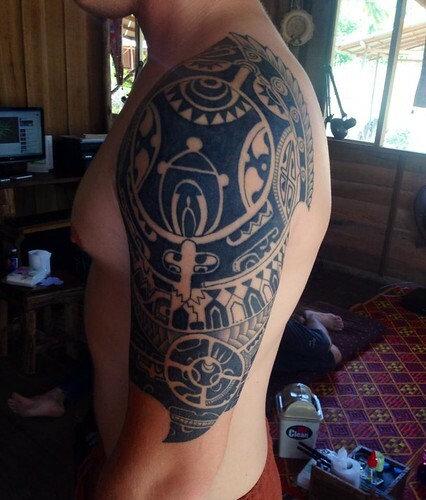 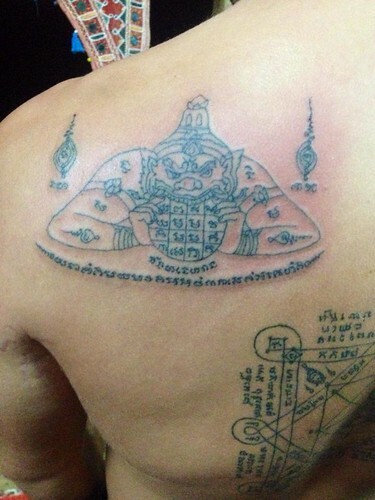 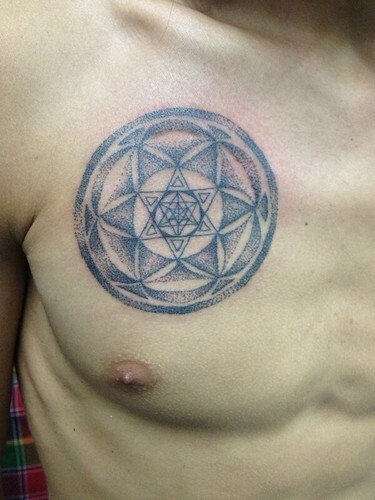 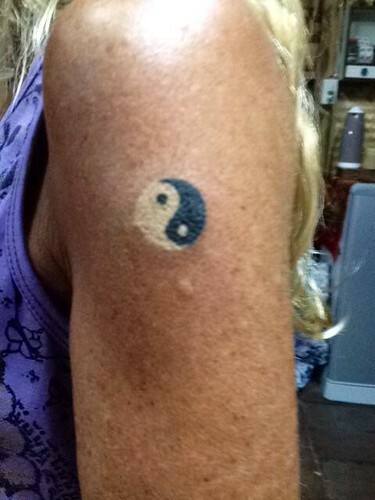 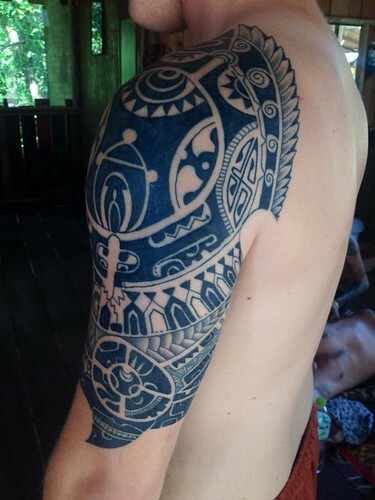 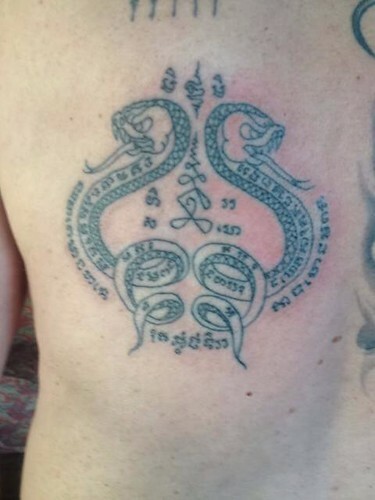 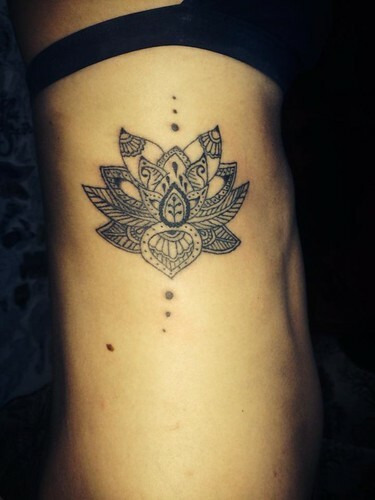 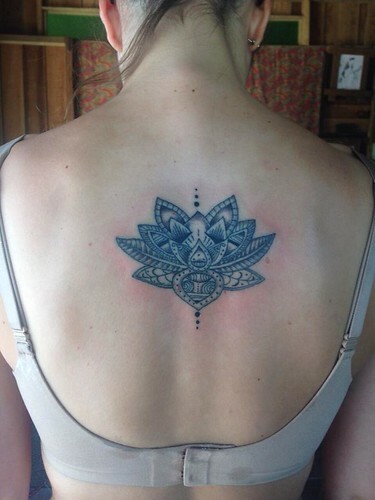 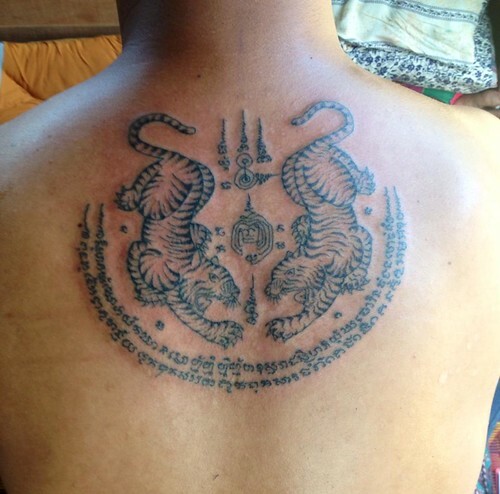 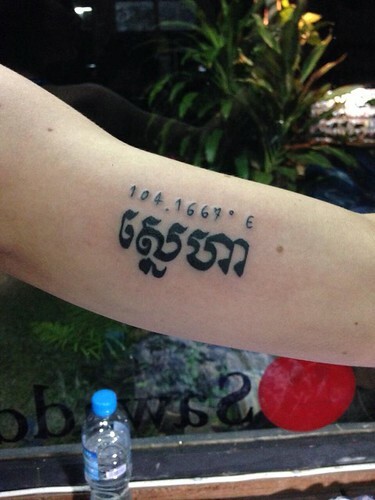 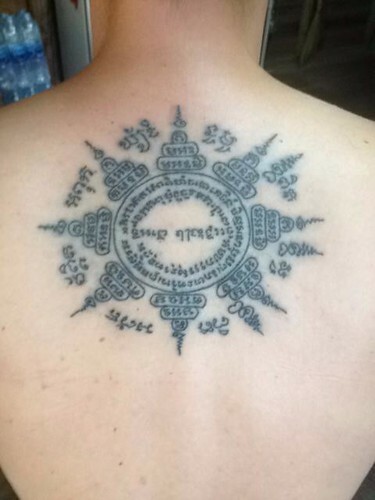 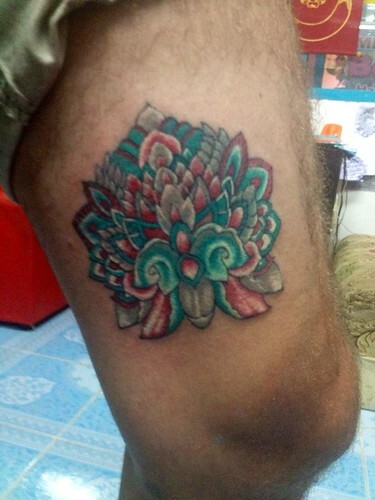 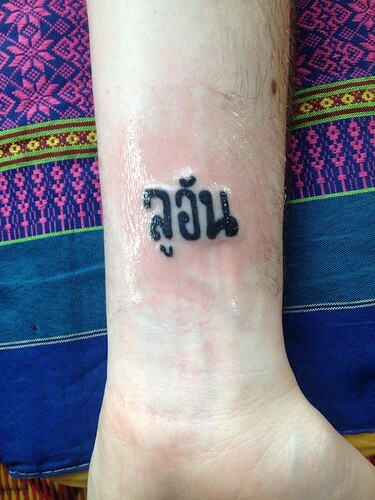 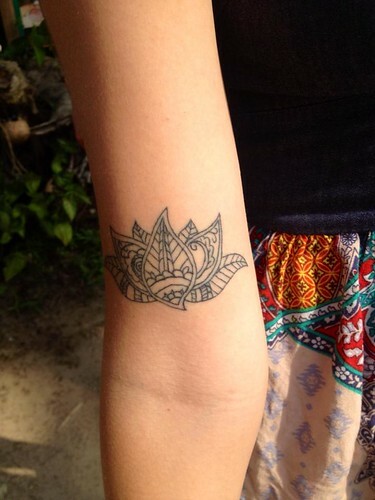 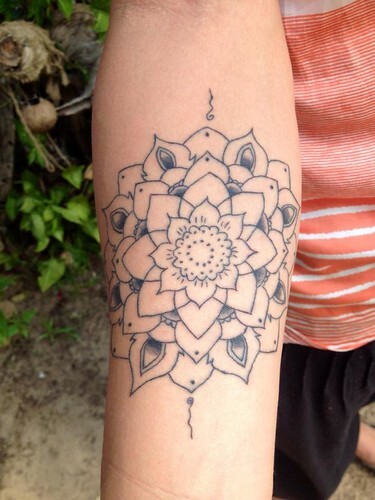 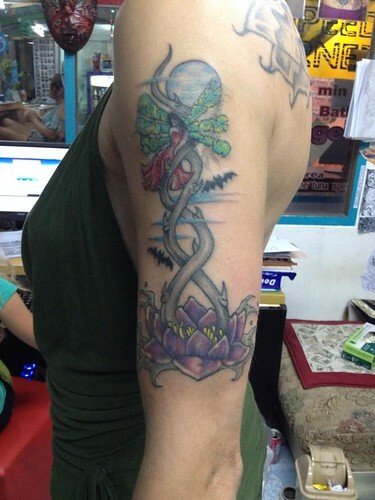 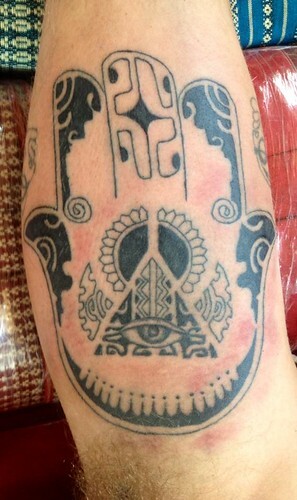 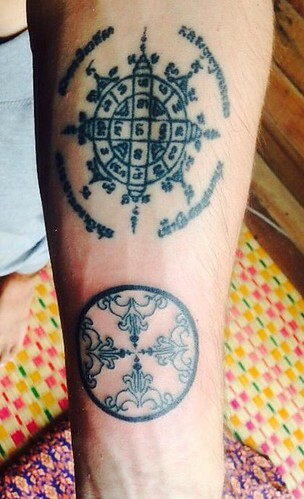 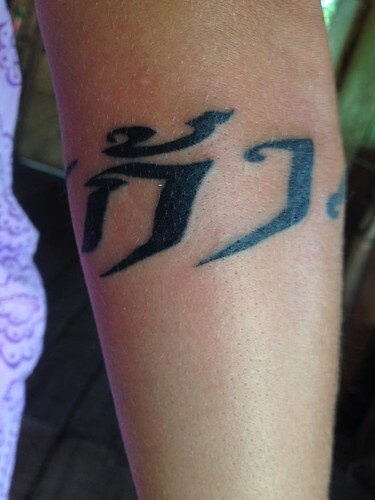 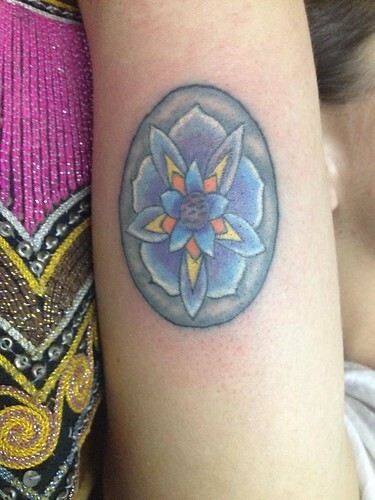 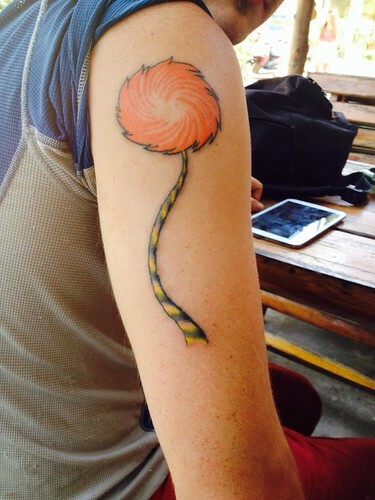 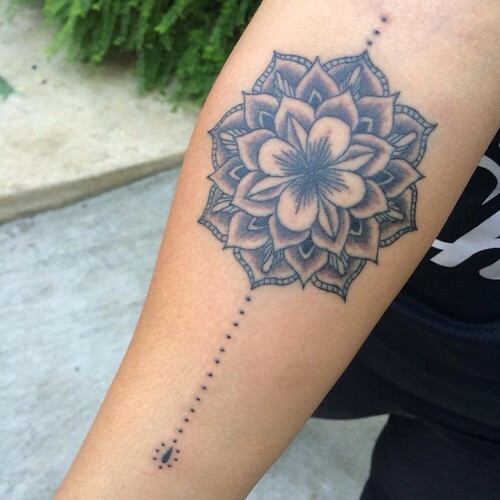 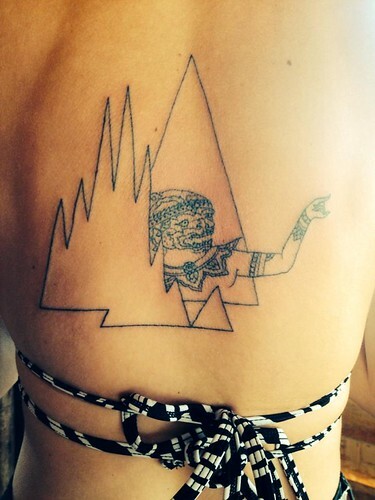 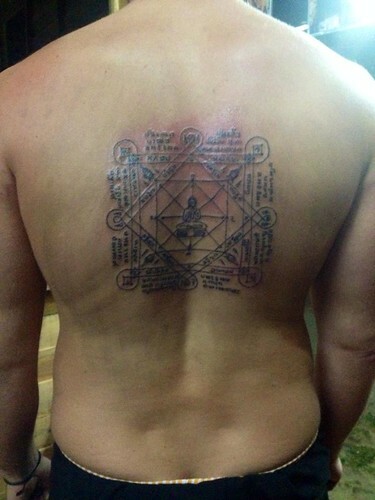 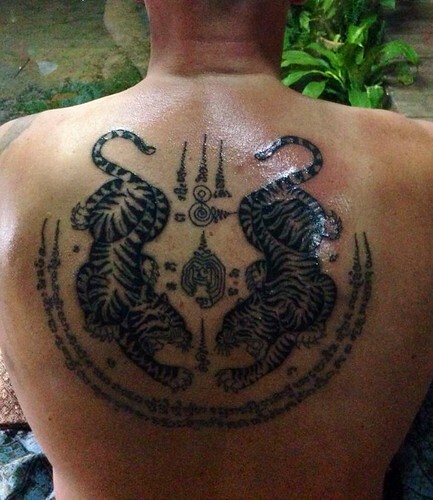 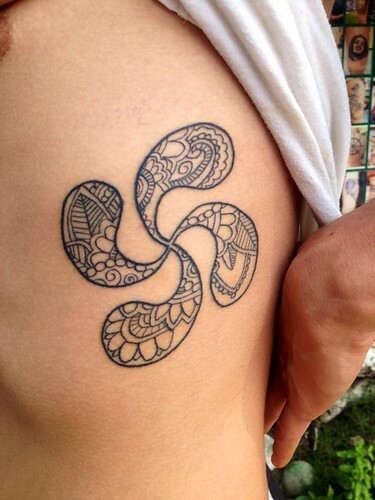 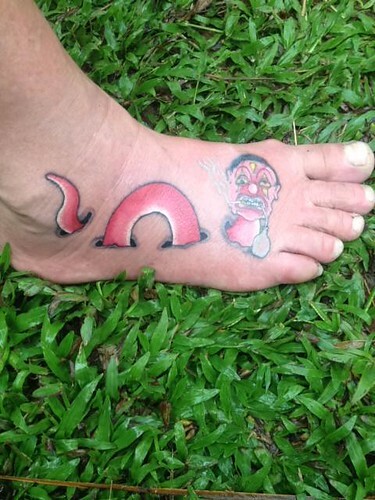 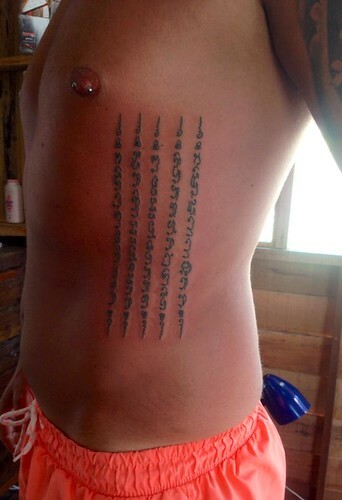 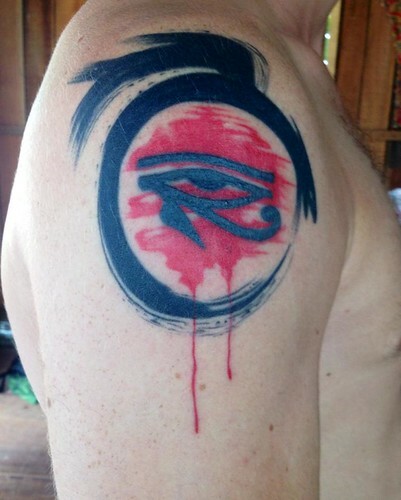 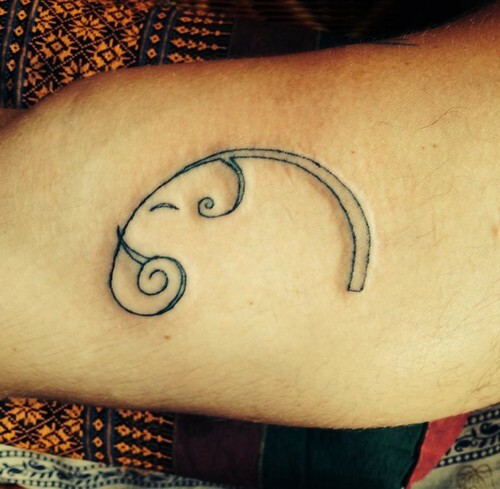 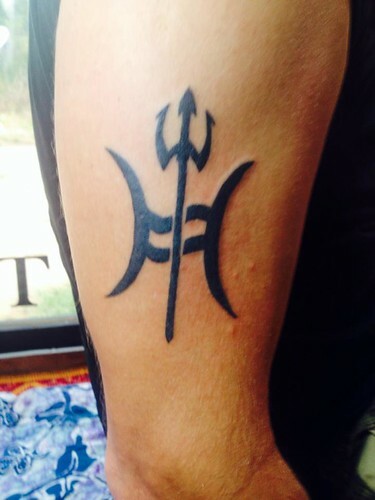 From Yantra or Sak Yant tattoos (what is it?) 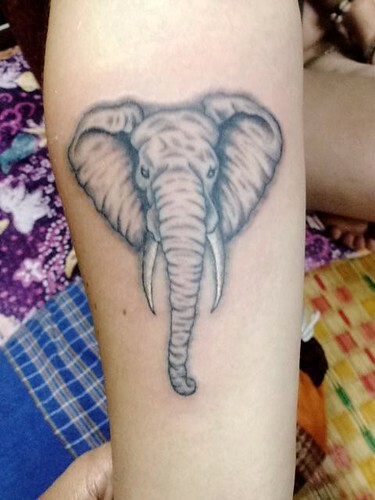 to flowers, butterflies, elephants, tribal, skulls, logo or whatever is in your mind, in black or coloured, King can tattoo anything on any part of your body. 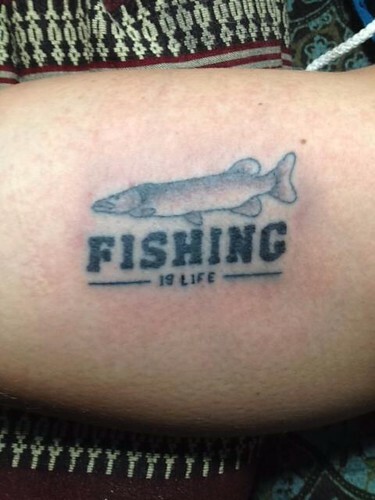 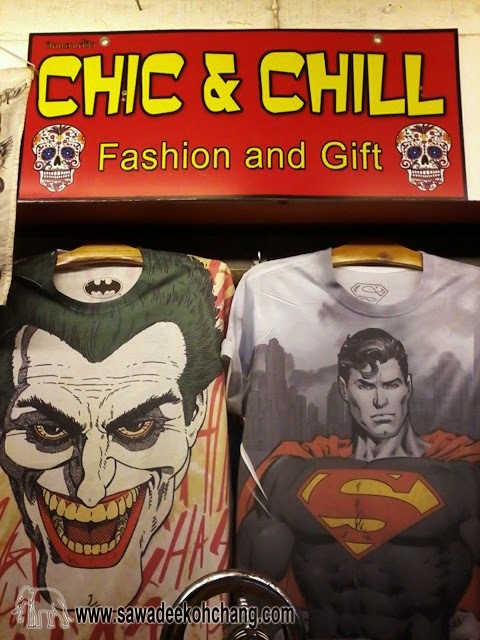 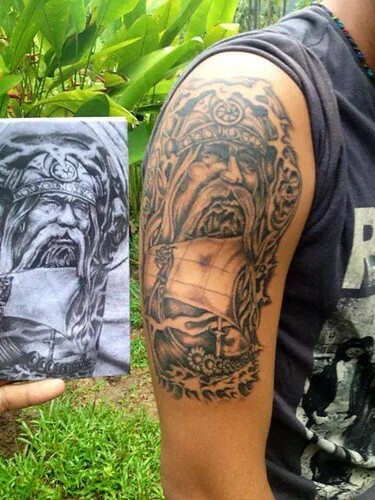 Cover tattoos are also possible. 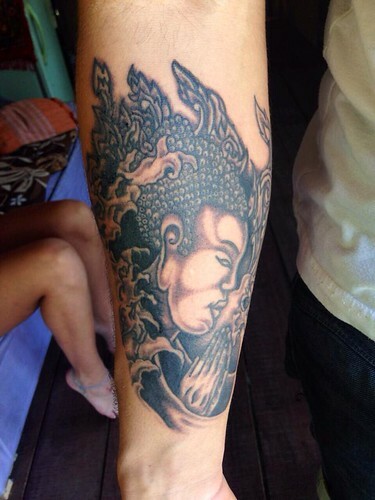 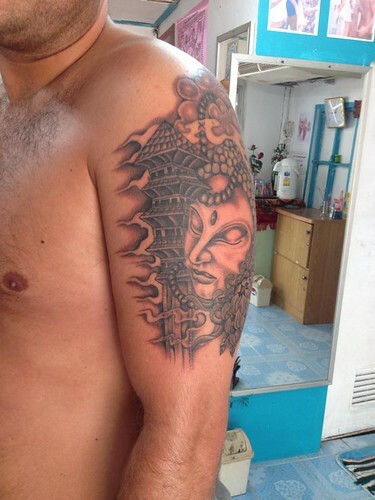 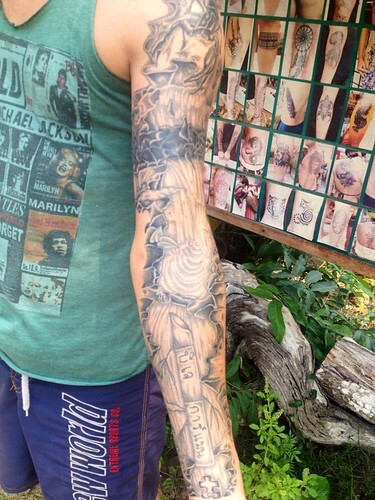 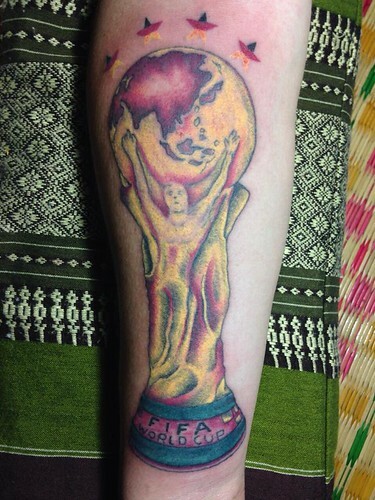 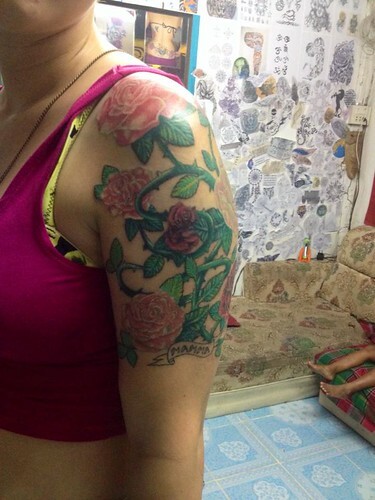 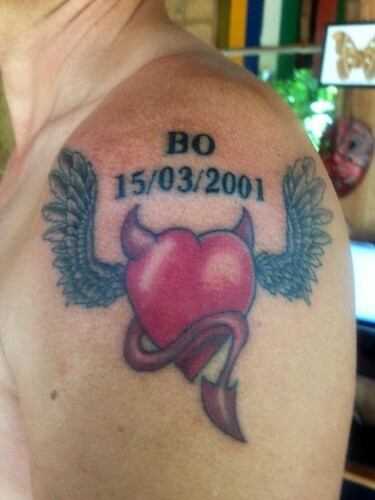 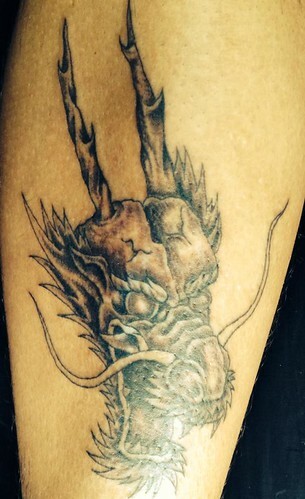 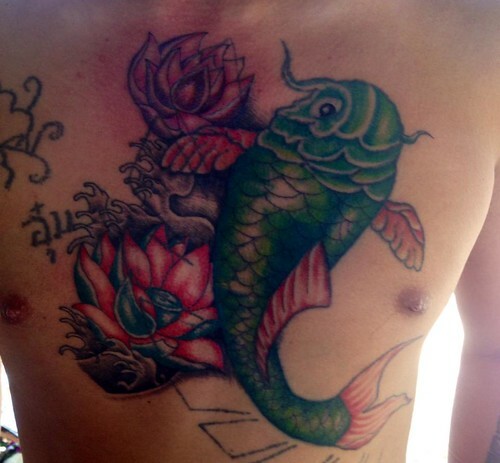 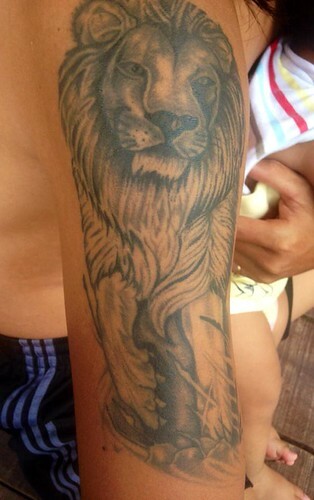 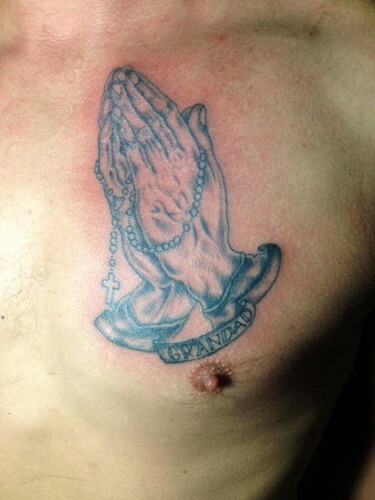 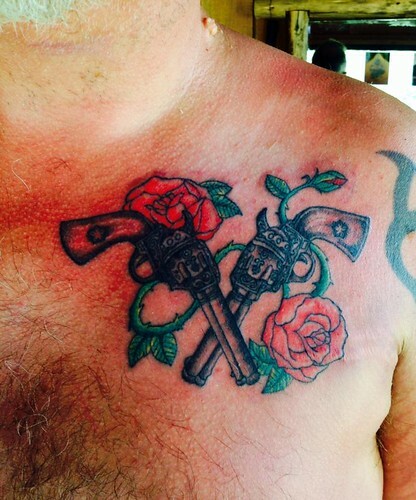 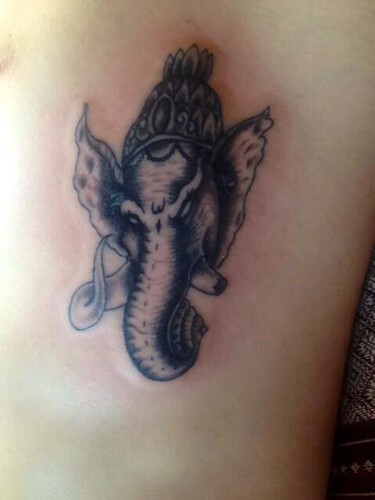 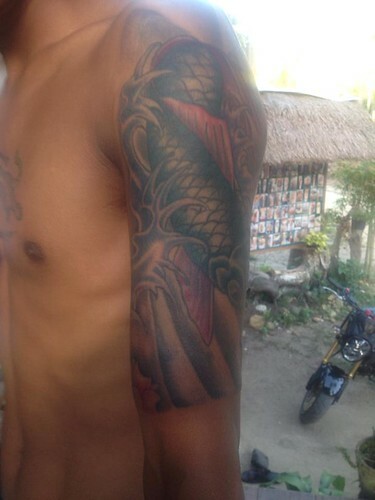 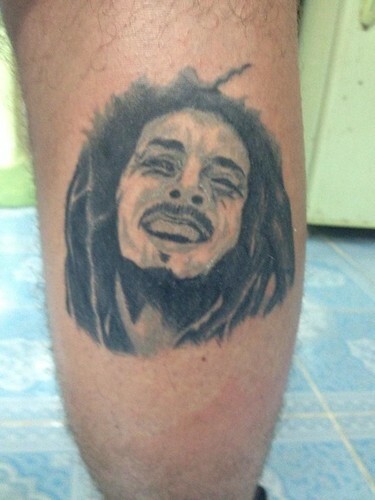 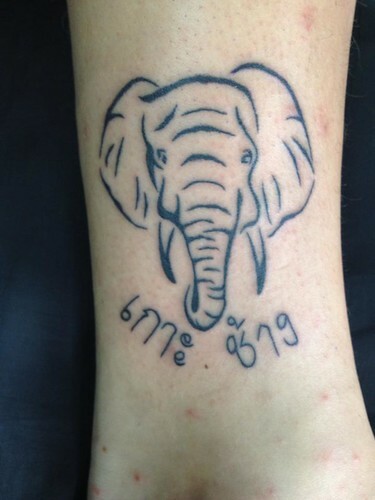 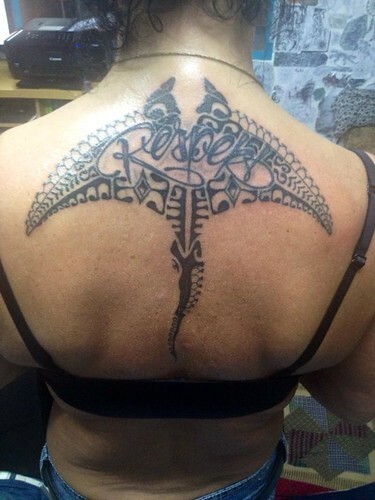 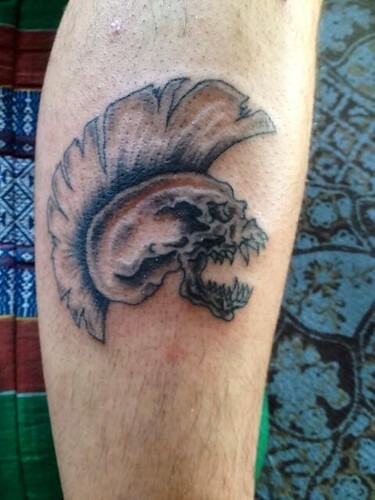 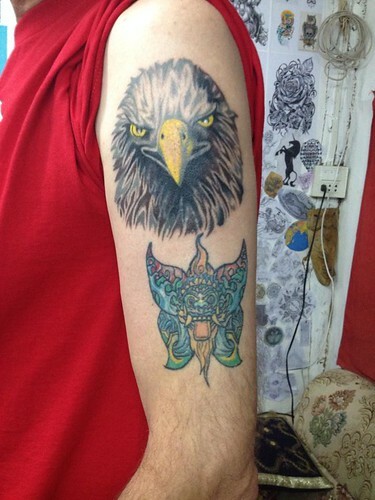 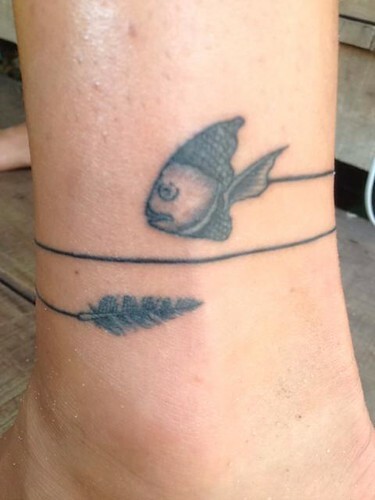 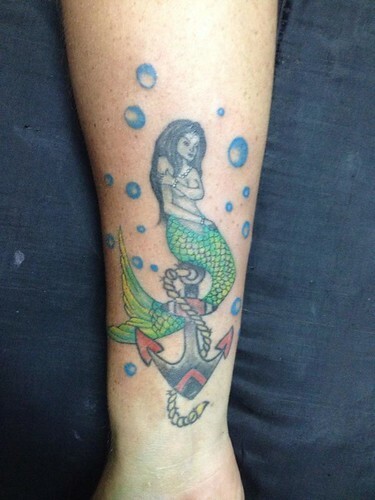 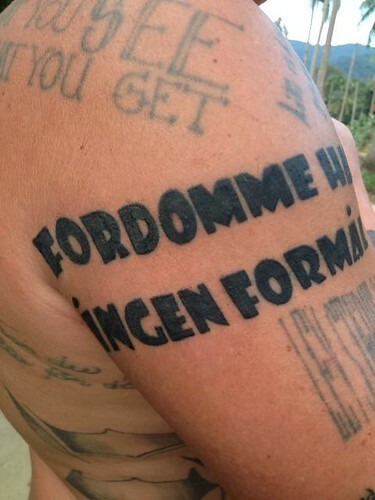 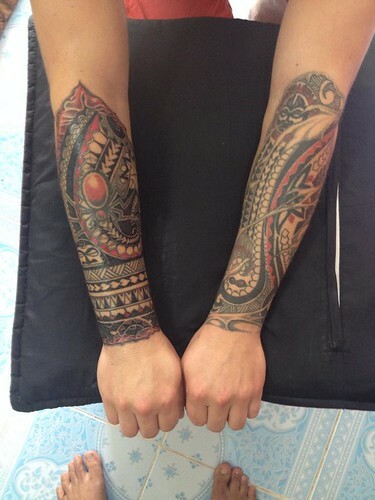 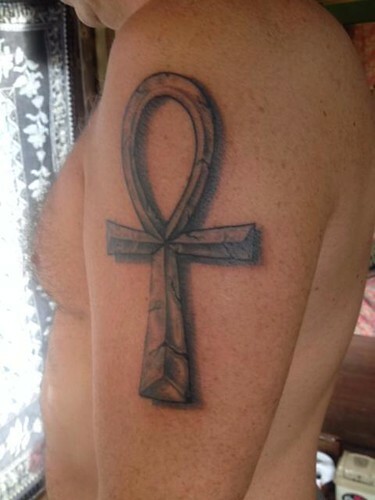 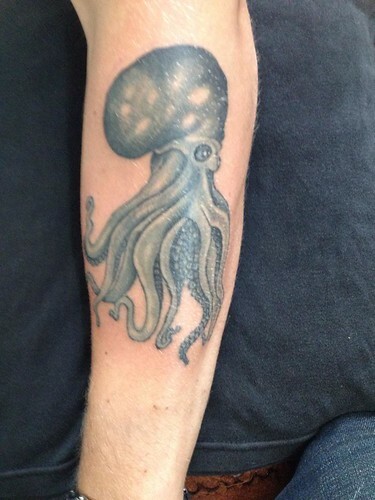 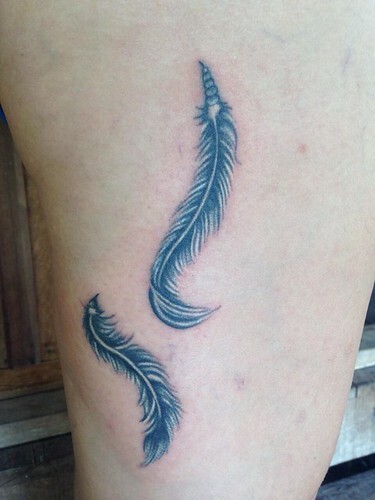 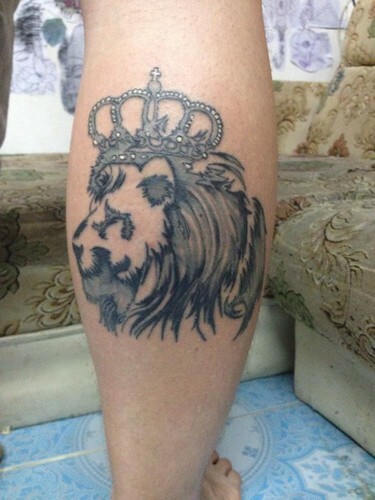 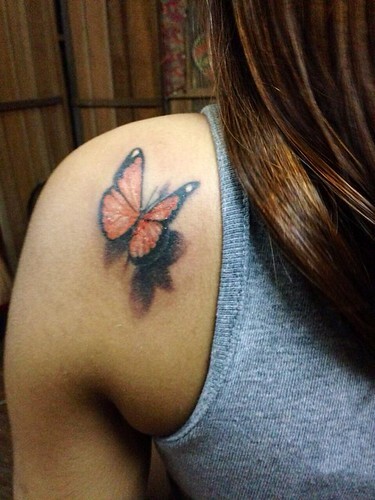 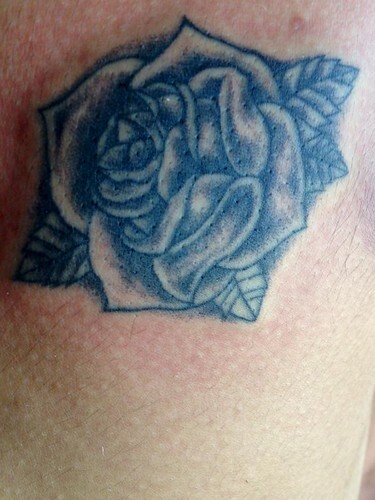 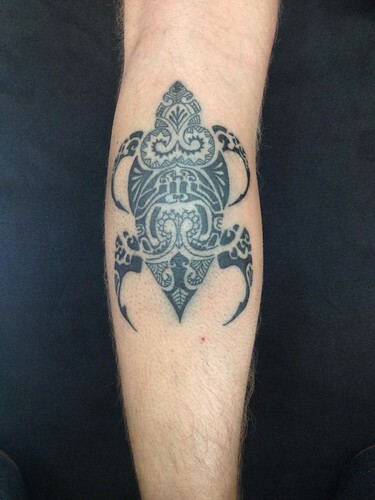 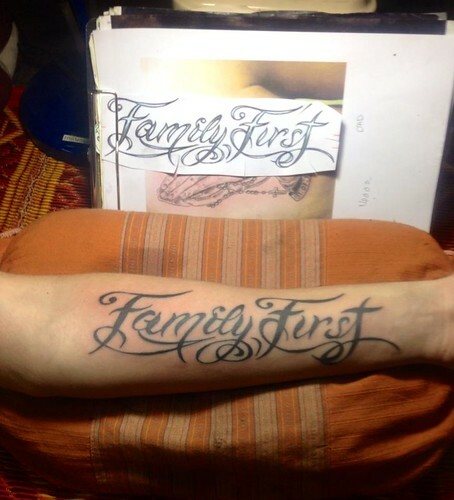 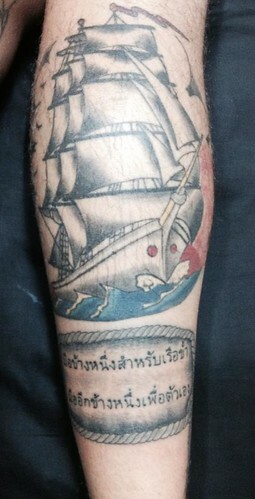 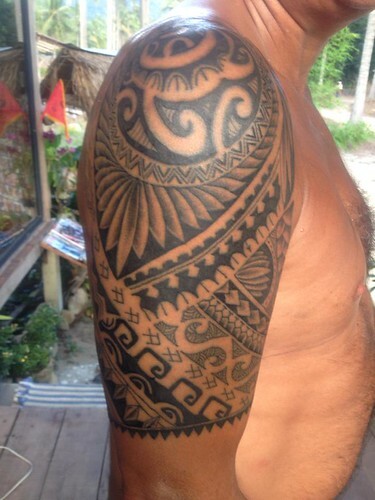 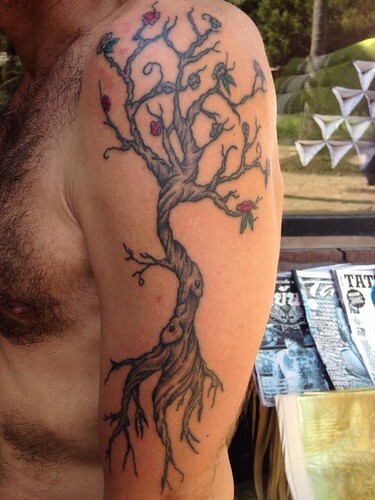 If you have an old tattoo which has fade or if you want to modify it, improve it or just cover it, King can do it!